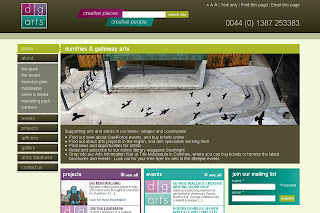 The Dumfries and Galloway Arts (formerly Association) website is now in soft launch mode. This is another partnership project with weesleekit who provided the design creative. We met with DGA(A) during the tender process and were able to present a unified case to develop the new site. The booking system for arts events links up to the Patronbase system with booking to take place on the patronbase server. This was built using a substantially customised WordPress 3.0 engine and it is a good way to learn the strengths and limitations of the new Blog/CMS system.